Thanks to all those who joined in with this years Halloween Spooky Parade in Hartcliffe and Withywood. Over 170 children were involved in the workshops, parade and activities after, with many many more families coming out of their houses to cheer us on our way. BYCA, Bristol City Council, Dundry View NP, Safer Bristol and Knightstone. Wow what a great, if wet, summer! 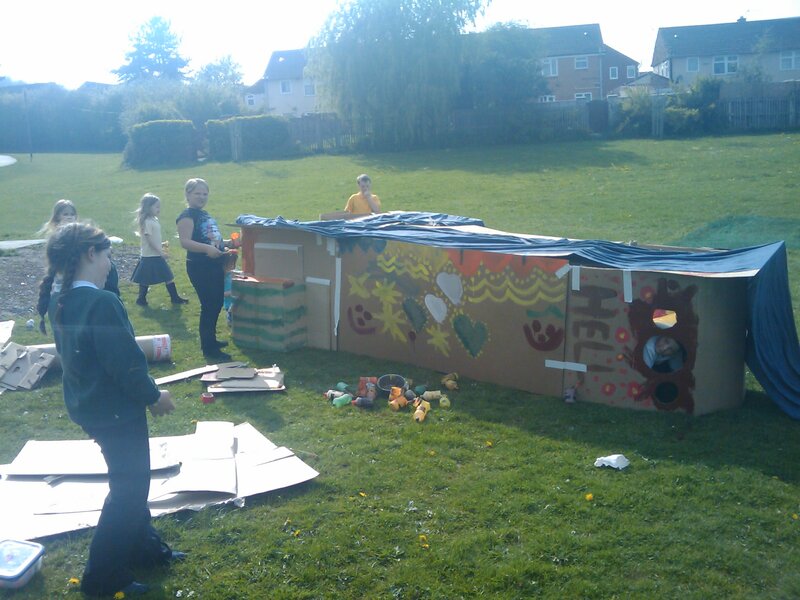 The CSV Play Rangers have been out there engaging 4200 children and young people, delivering outdoor play in Hartcliffe, Withywood, Knowle West, Stockwood, Knowle, St. Pauls, as well as at the Bristol College Green Playday event. The team have cooked on fires, created dens, organised playful Olympics and made medals, make rope swings and ladders. 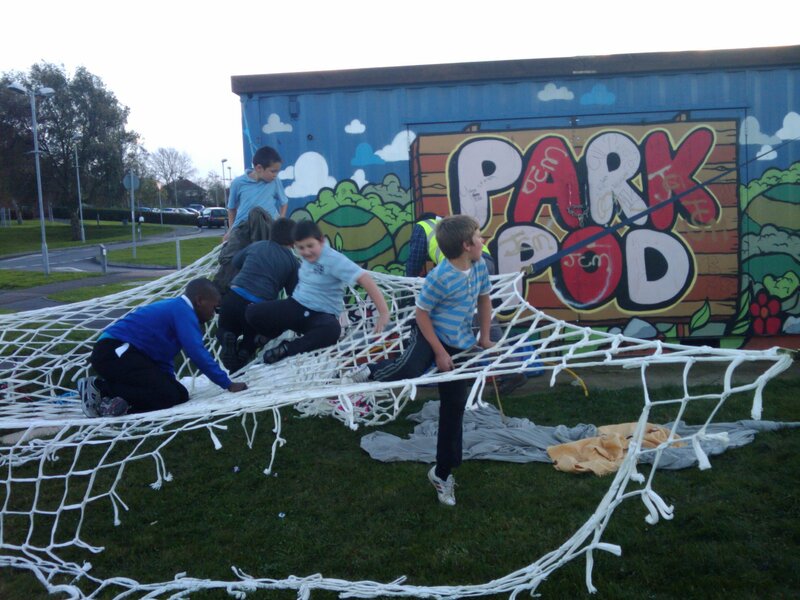 We have decorated, opened and playfully used the new Park POD in Withywood park. The CSV Out2Play team have also delivered Forest Skills days for the CAF Family Bonding project and the HAWKES Stepping Stones summer program, all of which were really good fun even in the rain. The Stepping Stones program ended with a film showing of the summer 2012 project at the Knowle West Media centre which was a great way to celebrate the end of the summer. CSV Out2Play have supported and had help from many volunteers over the summer: 20 adults and 10 young people gave between 10 and 60 hrs of their own time to be involved in summer events – We thank you for your hard work and appreciated the time you have given to CSV and the children we work with. 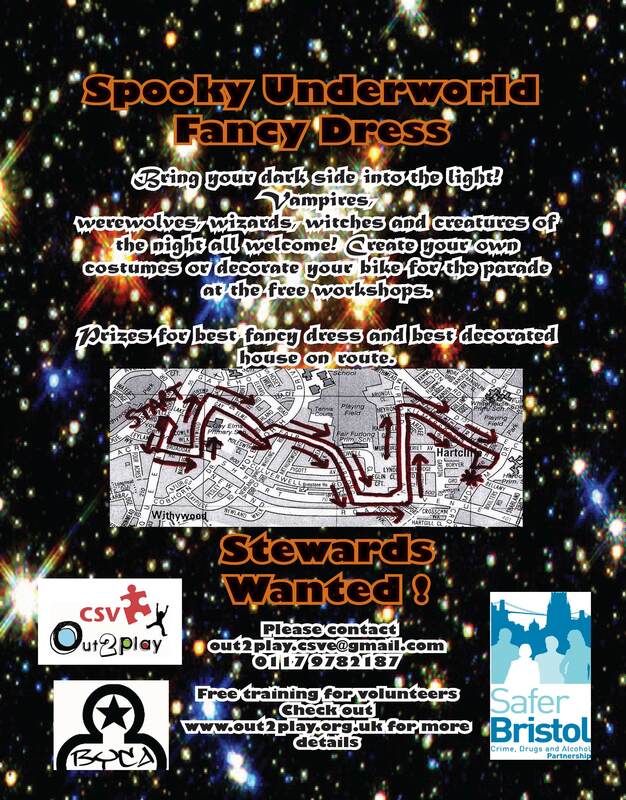 After the success of Spooky Parade last year CSV Out2Play are working with community groups and local residents to deliver another week of Halloween fun in Hartcliffe and Withywood. There will be arts workshops including making fancy dress, bike decor and creating puppets for the parade run by our Play Rangers 12-4pm Monday – Thursday building up to the parade on Halloween – Sunday 31st October. Many thanks to our funders for making this happen- Bristol City Council, BYCA, Safer Bristol, Withywood Park Group- and our partner Hartcliffe and Withywood Community Partnership. CSV Out2Play have had a brilliant summer running Forest Skills, green arts and Puzzle Island days with holiday playschemes and organised many Playdays. We had fun, hope you did too!! These workshops are aimed at engaging people who work with children or teenagers in an outdoor setting, or who are interested in adapting their practice to the outdoor environment. FREE membership to the Out2Play Resource Library is offered with each place booked as well as a brief induction to how the Resource Library works. Fun, messy and practical workshops showing you ways to encourage children to cycle, to cycle safely and to get interested in taking care of and fixing their bikes. Bring a bike if you can. Try out easy and interesting outdoor play activities including getting children involved safely in fire making and using tools to create things out of wood. 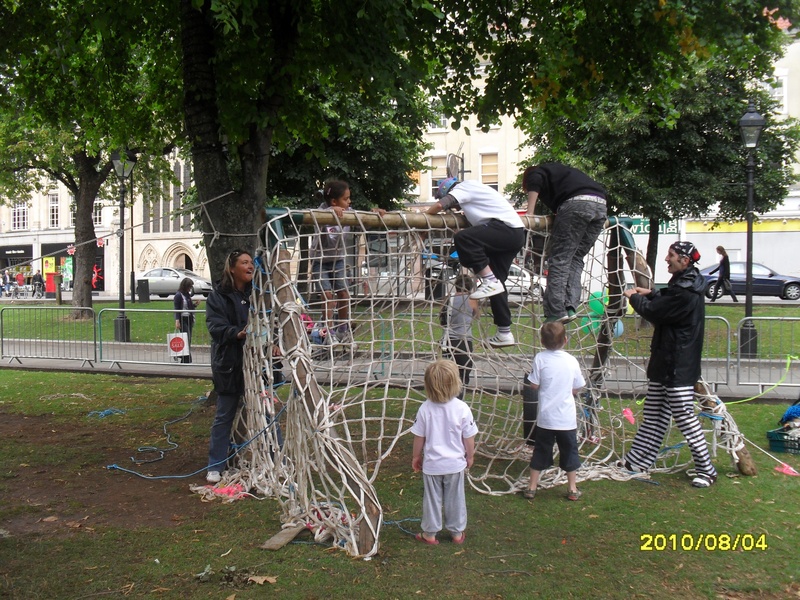 Take away example Risk Assessments to use in your play setting. Facilitating the creative use of defunct objects & recycled household scrap in children’s imaginative play. With a choice of workshops take back examples of activities you can do with the children you work with. Discuss the issues around challenging behaviour in play especially when outdoors and look at ways of dealing with this behaviour both for the playworkers and children involved. 2 day certificated course aimed at outdoor play. Be prepared to handle some basic tools and get a bit messy as you test your prototype and, by the end of the workshop, you will have a large working spin painting machine to take away with you. Please go to the following link to find out about times and dates. We are looking at holding more workshops over the Easter school holidays, please contact us if you are interested. Take a look at our Outdoor & Environmental Play Resources Catalogue by clicking on the links below. The catalogue lists the inventive activity kits, sports and games equipment and sturdy outdoor gear available for hire here at the Out2play Resources Library, Bristol’s one stop shop for outdoor play resources. Scroll down and click on the map link to locate our premises in South Bristol. Free Playdays with costume and lantern making workshops. 12-5pm. Tuesday 27th & Thursday 29th October. Cottle Road Park. Friday 30th October. 5.30pm from Cottle Road Park to Craydon Park Open Space. Monday 26th October. Kings Head Park. Wednesday 28th October. The Big P in Wilmott Park & The Core. Thursday 29th October at Withywood Park. Saturday 31st October. 5pm minibus pick-up from Kings Head Park and Bishopsworth shops. 5.30pm Parade starts from Withywood Park. We are soon to add a link to the Resource Centre catalogue, but in the meantime to give you an idea of what there is to borrow, here is a quick summary of our stock. Following each heading are a few examples of stock from this category. Sports: football, tennis, cricket, hockey, pogo stick, helmets, sports days’ equipment. Games: space hoppers, giant outdoor board-games, circus skills, parachutes. Scrap: Carpet tiles, fluorescent rip stop (streamers), plastic tubs, recycled fabric. Adventure and Survival: shelter building kits, rope ladders and swings. To be sent a hard copy catalogue or membership pack, please email or call us. You can also download a membership form using the link below. 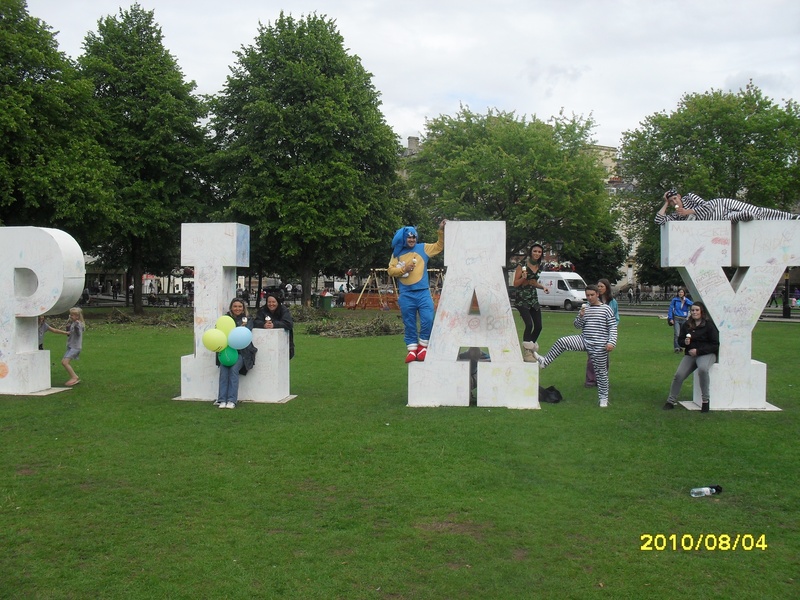 Summer play – where and when? We look forward to seeing you out2play soon! All sessions are free and open access in outdoor spaces. NB We are not a crèche and not liable for children during the session. Recommended age 8– 13 years old. Under 8’s are very welcome, accompanied by a parent, carer or sibling. Volunteer placements and free training for young people & adults. Normal after school play ranger sessions resume after this in Knowle West, Hartcliffe and Withywood. The Out2Play team are really busy this summer, not only with their regular play sessions which continue through out the year in Hartcliffe and Knowle West, but also with one off Playdays and Puzzle Island sessions. We are spending 5 weeks piloting a new drop-in Puzzle Island program in Bishopsworth and Stockwood from 27th July – 27th August. We will hold this imaginative outdoor game in local parks and encourage children to navigate the island, rise to challenges and bring the ‘magic’ back. We are offering an exciting Playday in Knowle West on Broadplain House playingfield, Wednesday 19th August 11-4pm with a summer fair theme. Play Rangers will be at most the Big P events in Harcliffe, Willmotte Park held on Wednesdays during the summer holidays as well as at the Millenium Green Funday on 3rd August. All this and much more ……..